Your spark plug sends sends an electric current from the ignition system into the combustion chamber, then igniting the fuel that powers your vehicle’s gasoline engine. After continual driving around Grand Island, spark plugs need to be replaced. Find out when it’s time to replace your spark plugs, and then get yours serviced near Hastings at Midway CDJR. Mileage – Most manufacturers have a recommended service interval for spark plugs, but it depends on the make, model, year, and engine of your vehicle. Some spark plugs are good for as long as 100,000 miles, while others need to be replaced as early as 30,000 miles. Generally, on vehicles like the Ram 1500, you’ll want to replace your spark plugs every 10,000 miles. Check Engine Light – If your spark plugs need to be replaced, your check engine light will likely come on. Car Stalling When Starting – If your car stalls or stutters when you’re starting it, there’s a good chance it’s time to replace the spark plugs. Alternatively, if it fails to turn over it all, then it’s probably a dead battery. Poor Gas Mileage – When your spark plugs get old, they waste more gasoline. This leads to poor fuel economy and more expensive gas bills. Rattling While Idling – If your engine makes a pinging or rattling sound when you’re at a stop light, it may be time to get the spark plugs replaced. 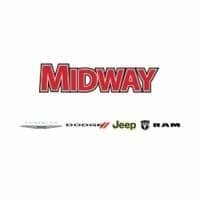 If you’re not experienced with auto service, or if you go blank when you open the hood of your car, then it’s a good idea to count on the factory-trained techicians at Midway CDJR. We’ll take care of your spark plug replacement and help you keep track of your Ram service intervals and Jeep service intervals—from oil changes to transmission fluid and beyond. Plus, with our rotating service deals, spark plug replacements won’t have to break the bank. Make the way from Hastings to our service center in Kearney, and contact us with questions on the way. 0 comment(s) so far on When Should I Change My Spark Plugs?